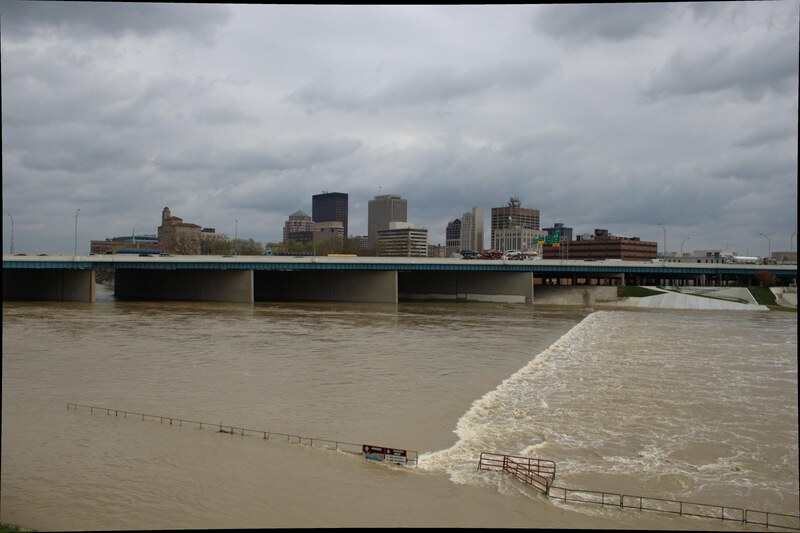 Photos of the flood control contrivances in and around Dayton. All of these were taken on 3 May 2011. But first, a little history and engineering detail so you'll have a better appreciation of the pictures. 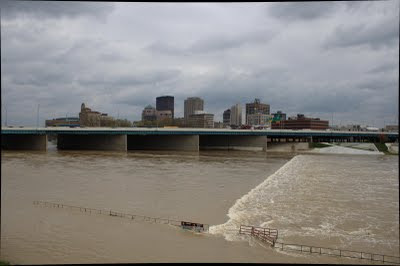 Arthur P. Morgan came to Dayton after the 1913 flood to design a flood control system to protect the entire Miami Valley. 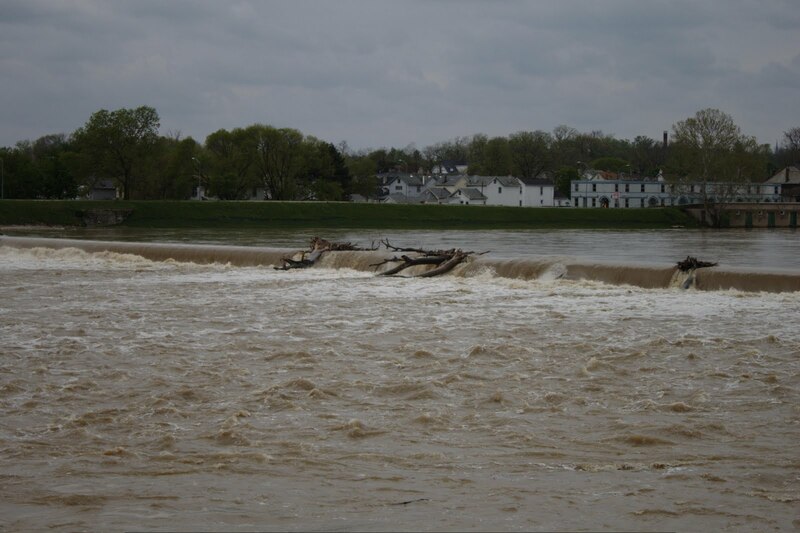 One element of this system was a dry dam—a dam that held water only during a flood and released the water at a rate that the downstream riverbed could carry. 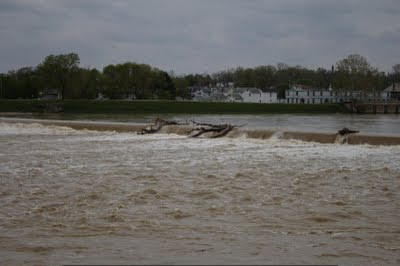 The problem was that the speed of the water through the dam made it powerful and destructive. To solve that problem, Morgan went with Col. Edward Deeds to his farm in Moraine where they built models in his swimming pool. They developed the hydraulic jump, which sends water through a series of baffles and steps, and then finally into a low wall that forces the water back onto itself, dissipating its own energy. This process of turning water onto itself is the hydraulic jump. From there, the water flows downstream calmly. 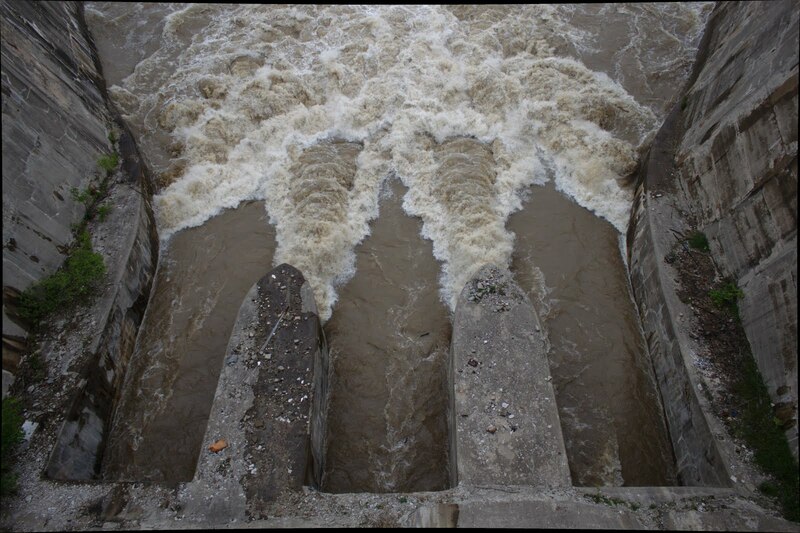 This technology is still used in hydrological engineering throughout the world. Here's a graphical depiction of a hydraulic jump. A basic 1-D analysis follows the figure (clicking the image should take you to the free Google e-book). The bottom line is the important part. 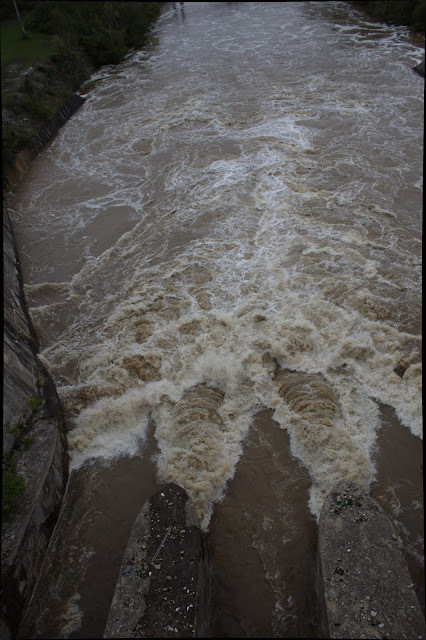 The hydraulic jump works by increasing the rate of turbulent kinetic energy production, this leads rather quickly (immediately if you assume equilibrium turbulence) to an increased rate of turbulent kinetic energy dissipation at the bottom of the energy cascade. The destructive capability (momentum) of the water is greatly reduced in exchange for raising its temperature ever so slightly. The following figure shows the cuts that had to be made for the outlet channels and hydraulic jump pools (note Huffman Dam in the center). And this one shows an aerial shot of the Huffman Dam just after completion. These views from the top of the Huffman Dam show the turbulence at the end of the outlet channels due to the hydraulic jump. These types of momentum dissipation mechanisms are also used throughout the city. 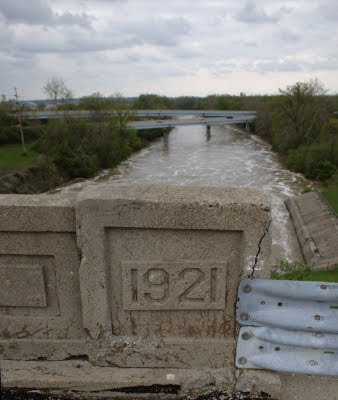 The submerged dams take momentum out of the four streams that come together in the Dayton city limits: Miami, Mad and Stillwater Rivers and Wolf Creek. There's talk of replacing these with something more water-sport (canoe / kayak) friendly.